Sweet potatoes with cheese? Yes, please. Meet your next favorite Thanksgiving side dish recipe. Sweet potatoes are always on sale during the holidays and seem to last forever in the pantry. I recently found one from 1974. That’s when it was all the rage to top sweet potatoes with marshmallows. Lose that recipe. Try this fresh one inspired by a meal I had in a café in Paris. Any opportunity to combine vegetables and cheese should not be missed. In a saucepan, heat the heavy cream over medium heat. Add 1 cup of shredded Gruyère or Swiss, the nutmeg, and salt and pepper. Cook, stirring, for 5 minutes. 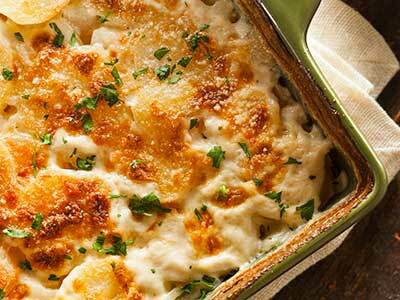 In a buttered casserole dish, place a layer of potatoes and then a layer of the cheese sauce. Repeat until all the potatoes and cheese sauce are used. Sprinkle the remaining ¼ cup shredded cheese and the grated Parmesan over the top. Set the casserole dish on a cookie sheet and bake for 45 minutes, or until the sauce is bubbling and the top is golden brown. Cool for 10 to 15 minutes to allow potatoes to set, garnish with scallions, and serve.